November 2016 issue of Safari – a knowledge and science magazine from India – Gujarati edition – published on time. As we were a little busy with the festival season, we are publishing our unbiased reviews for this issue a little late. It is often said we should not judge the book (or anything similar) from it’s cover, but we often do it right? If the cover is attractive and provide enough hint about what to expect inside, the chances are high that the potential buyers will go for it. The cover page of November 2016 issue of Safari Magazine (Gujarati Edition) is having cheerful background colors. Having photo of Mt. Everest in multiple color shades and showing dark figures of some trekkers makes it interesting. There are some thumbnails and short titles for other articles give enough information about the content of the issue and readers will find it attractive and informative at the same time. We have often mentioned earlier that we consider the editorial, an important part of any media (be it a newspaper or magazine or similar). Not only because it gives a chance to the editor to express his/her vision about the content of the issue you are reading but it also works like a bridge between the reader and the editor. Here editor can give any direct message to the readers, or talk about current happening or anything similar. Harshal Pushkarna, the editor, talks about the “ban on Chinese fireworks” campaigns run through Indian this year (on the occasion of Deewali/Deepawali). It is good that people these days are more aware with political situations and take part. Harshal’s analysis about the Chinese economy and how much this ban affect it, is quite interesting. The editorial is worth reading piece of the issue for sure. Nature believes in versatility and we see a lot of species around us which we found interesting / amazing or different than our imagination. Starfish is one such creature. Though Safari magazine have published articles on star fish in earlier issues also, we were curious to see if something new is added here. However for the readers who are not following it since years, it will be quite interesting article. The facts like, Starfish is technically not a fish, are good to know. Also the initial part of the article raise a question in your mind that “why then the Star fish is considered as a living creature and not a plant”, the article however gives you answer. The facts about Starfish’ ability to re-grow its organs is good to know. Overall a balanced and good researched article which is worth going for. Why it took so much (time) to conquer Mount Everest? Mount Everest is known to everyone for the fact that it is the highest (or tallest) mountain. But there are many facts which are rarely known. One fact is, Mt. Everest is first found in 1852 but it was successfully climbed for the first time in 1953 – almost a 100 years later. 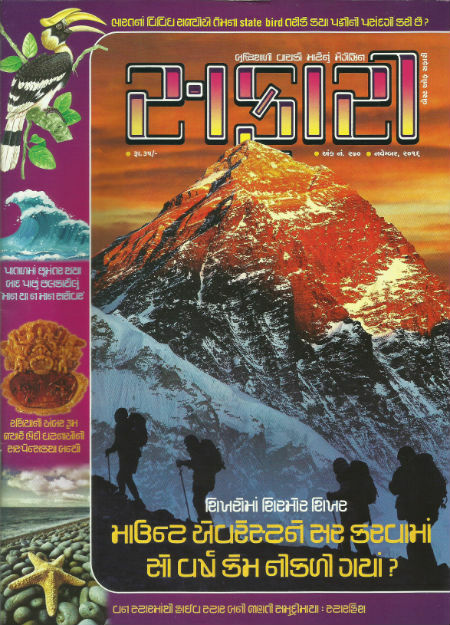 Digambar Vyas, brings in a nice article which is studded with some good images and illustrations, about Mount Everest in this issue. The article is written nicely and the statistical information is also presented in interesting manner. Readers (especially the nature lovers) will find it definitely worth reading. And yes, it has the amazing photo of Tenzing Norgey on the peak of Mt. Everest. We love treasures and reading about it, right? The Amber Room (aka Catherine Palace) is thus the point of interest for a lot of people since many years. Published in earlier issue of Safari as well, the article about – The Amber Room – is written by Nagendra Vijay, a famous writer who is known for his writing skills as well as vast knowledge and research. The Amber itself is rare to find and difficult to get. In addition the room itself is a treasure in terms of art. It is so fantastic that people consider it as the eighth wonder of the world. In addition to its value, Amber room have suspense associated with it, since it was first built. The history of it travels through Russia and Germany. There were times when people started considering that the Amber room is lost. And, a replica of the same was prepared. And then there were news that it was possibly found again! Well, we cannot reveal more here, we suggest you to explore it in article which is having some amazing pictures of the Amber room and it’s artistic pieces. Despite of being one of the deadliest disaster, very few people (internationally) know much about the Lake Peigneur disaster. Digambar Vyas’ article about it creates curiosity about the incident by mentioning Lake Peigneur – as mysteriously disappeared and reappearing – lake. Happened in 1980 the disaster is definitely worth to know about. The article is written nicely and it is informative. The article gives – All About – information about this mishap. Why and how the Roti (also known as chapati – flat bad bread – food of India) is puffed, despite of having the fact that its “small round lump” is of single layer only? What is the difference between Tortoise and Turtle? How the corp of Shingoda (kind of acquatic plant, trapa bispinosa.) is taken? Why the water is grow in size when converted into ice, while all the other elements shrunk when getting colder? Why the shoes start shining after you brush it using a towel (or brush) after polishing them? Why the stringed musical instruments like Veena (lute), Sitar, Tamburo (a turkish guitar with 4 strings) and others have bowl made from gourd at one end? What is dandruff and why it appears? How anti-dandruff shampoo deals with it? Which country have invented the postcard? The last cover page has an interesting article about state birds for various states of India. The article gives brief information for each of them and there are illustrations of them as well. As most people know about the national bird/animal etc., but comparatively few know about this at state level (especially for their non-native states); the article is worth reading. There are other segments and articles in the issue which are good to go for. However we cannot tell everything about each of them to keep your interest intact when you read it.